As we work together on a mission to erase stigma around mental illness, it is important to continue to strive to share community resources, research findings, and support in promoting mental health well-being. 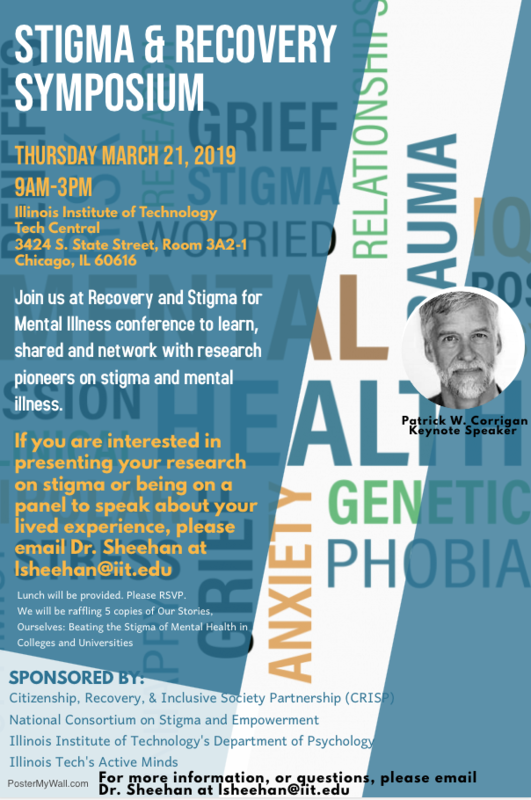 The Citizenship, Recovery, Inclusive Society Partnership (CRISP); the National Consortium on Stigma and Empowerment; and Illinois Tech’s chapter of Active Minds have partnered to sponsor the Stigma & Recovery Symposium at Illinois Tech. Panel: We will feature a Lived Experience Panel, where attendees are encouraged to share about their experiences and story of living with mental illness. Each speaker will be given 10–15 minutes to share. Raffle: If you attend the entire conference, you can participate in a raffle for five copies of Our Stories, Ourselves: Beating the Stigma of Mental Health in Colleges and Universities. If you are interested in being on the panel, or presenting your research, please email Lindsay Sheehan at lsheehan@iit.edu.